As you drive up the Devil’s Dyke Road, north of the bypass, you reach a point where you are less than half a mile from four different golf courses. That’s a lot. By contrast, the whole thirty mile stretch of Downs between Shoreham and Hampshire contains exactly as many, “two at Goodwood and two north of Worthing” (Bangs, page 159). For nearly fifty years, if you had followed the road a bit further, to the very top of the Downs, you would have come to yet another golf course. This one was immediately adjacent to, and to the south-west of, the Dyke Park Hotel. 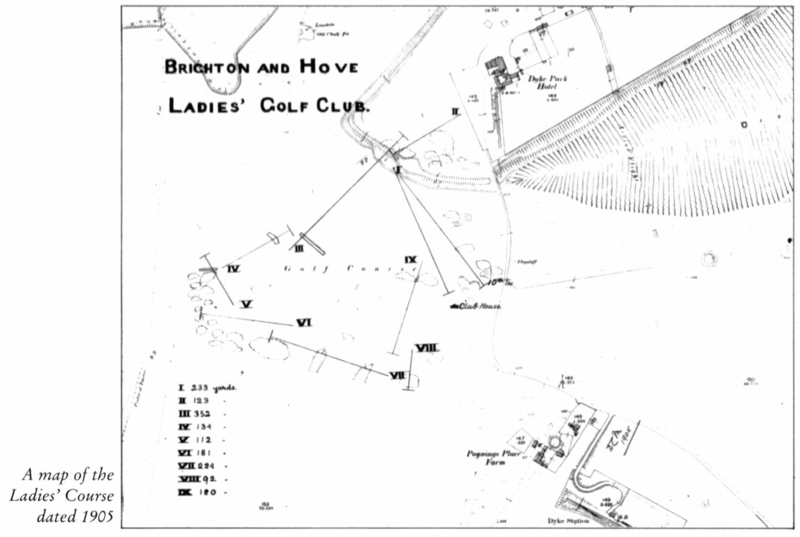 The associated club was an offshoot of the Brighton & Hove Golf Club [B&HGC] and membership was exclusively female: the Brighton & Hove Ladies’ Golf Club. The course existed from 1891 to 1939. It was served by the Dyke Station, located to the south-east just off the map image shown above, over almost the entire period. It was thus very conveniently situated for members who lived in Brighton or Hove although it seems that most arrived “by pony and trap or by bicycle, or later on, by motor car” (Hughes, page 64). It had its own clubhouse and catering would also have been readily available at the Dyke Park Hotel. 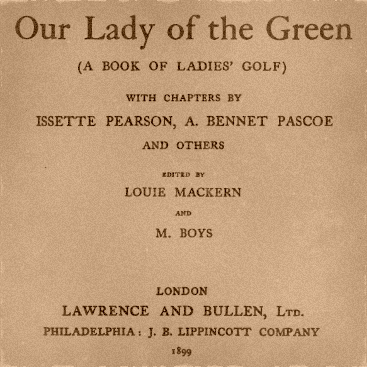 As a consequence of WWI, the course closed for the period 1916-20 but members used the grounds and the clubhouse to entertain wounded soldiers. 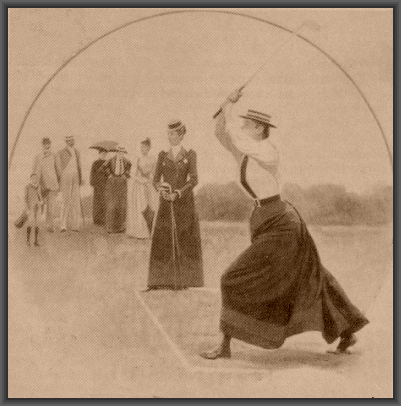 Play resumed in 1920 and the club began to attract younger players. The outbreak of WWII saw the final end of both club and course. The railway closed in December 1938 and the Ministry of Defence requisitioned much of the Downs. The clubhouse was completely demolished, possibly by Canadian tank crews. After the war, former members of the club had to fall back on their status as associate members of B&HGC if they wanted to play. Miss Starkie-Bence drives an ace to the North Town Field. Dave Bangs (2008) A Freedom to Roam Guide to the Brighton Downs. Portsmouth: Bishop Printers. 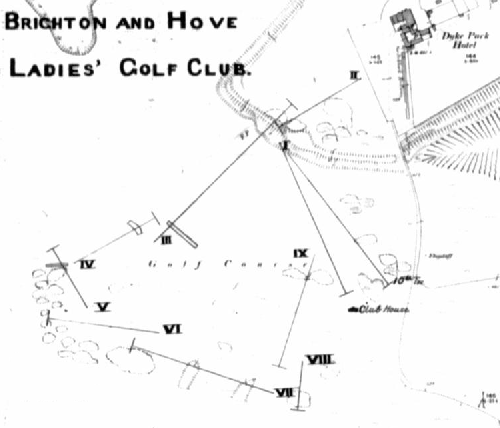 Barry Hughes (2000) Brighton & Hove Golf Club: A History to the Year 2000. Brighton: B&HGC. With thanks to B&HGC for their assistance and for granting permission for the use of the map. This entry was posted in Devil's Dyke, Local History, Sport and Recreation, Topography. Bookmark the permalink.